I’ve created the front engine mount in CAD (another post to follow) and now I need to test the engine height with the mount and the bonnet fitting – it’s no good having a beautiful mount if the engine then doesn’t clear the bonnet. I’ve gone for a trial fit of the mount (several hours of CAD and printing) to be sure it works before I go through the process of moulding and making the CF part. What I wanted to do was put the mount in place (it cradles under the front of the sump and bolts on to the front of the dry-sump). It also needs to curve around the awkward external dry-sump pump which seems to get in the way of everything. Having fitted it, here are a set of photos that attempt to show the bonnet in place, and the engine having about 30mm of clearance between the top of the engine and the bonnet. One of the other interesting things about doing this is it’s the first time in a couple of years that the car has had any bodywork attached. It’s gone (in my head) from an abstract chassis concept back to something that relates to being a car again. From a reference point of view, the sump will sit between 115 and 125 mm from the floor, and my suspension is height adjustable so on a track I can lower it a bit more. Right now, I’m safe to go over a house-brick without writing off the engine. Here you can see the bonnet resting on a clamped large table-mat as a reference line. (Clamped to the top chassis rail). The mat and clamps weren’t strong enough to handle the weight of the bonnet, so I needed another idea. So, what you can see sticking down is a piece of (cut to size) wood that represents the chassis rail height to the floor as a relative position. The table mat is now just sat there without any vertical load – it works well as a reference point. With the bonnet properly propped, this a bit of a scrappy shot down the bonnet. There’s loads of clearance here, and you can see the CF footwell and gearbox. More of the same here and you can make out the 3d printed blanking plates I made. And again – hopefully you can see the oil filler cap at the front a good 30mm below the bonnet. Here it is from the top down. It looks a tiny bit like a car again. Or ram pipes, or velocity stacks – whatever. 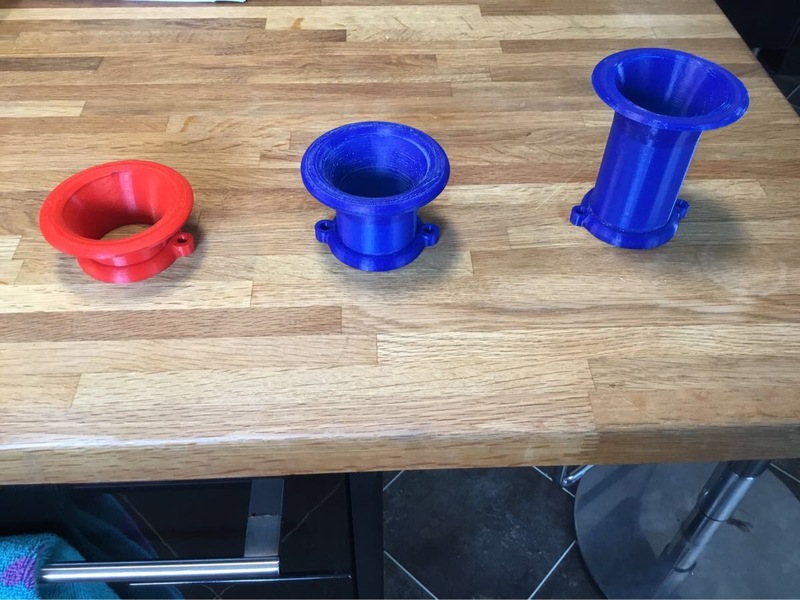 I’ve made these trial pieces. The plan is to have a veritably huge amount of length variations, so when I set my engine up on the rolling road, I can mix and match to get just the variances in length I need. When I say I, I mean Damien from Daytuner, but you know what I mean. So, the cunning plan was to get the short engine built this weekend, and I wasn’t far away until I had a mild issue that turned into a disaster. Well, a recoverable disaster, but not without effort and maybe cost. 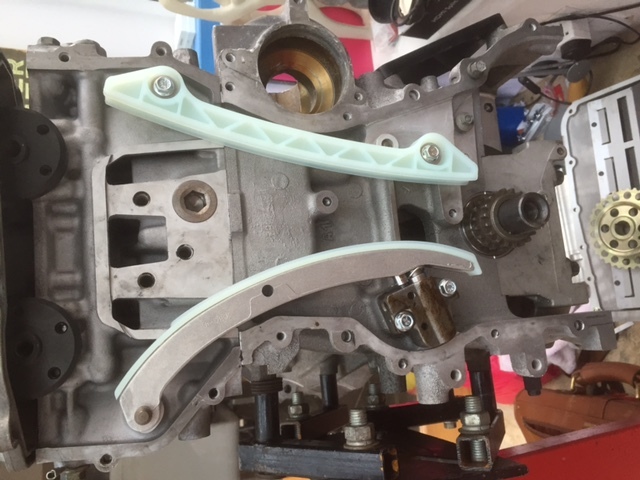 I have been time slicing between getting the printer working how I want it, and doing the jobs on the engine. The major job this weekend was getting the head on, with the ARP studs set. The head had been modified and professionally built for me, but you can’t put it on the block with the cams in place – they obscure the head-bolts. So, off came the cams, and in went the studs (threads lube’d of course) and on went the gasket and head (including the two small dollops of gasket). All the threads were painstakingly painted with the correct graphite paste and done so with an artist’s toothbrush. I’ve learned there’s no use really caking it on – it just squeezes out. All the pressure washers went on, and as I was putting the last bolt in to hand tighten it before the torquing sequence, I fumbled it and it went down an oil gallery. Mildly frustrating I thought, but no big deal – just take the sump off (only finger tight on three bolts) and it should have dropped down. I turned the engine over on the stand, and this is where it all went arse. Four of the cam buckets fell off on to the floor. I managed to turn the engine over before more did. Each cam-follower-bucket-type-of-thing is separately chosen for the correct valve clearance, and you guessed it, they’re all different. So, I don’t have a record of which is on which valve, and I’m just hoping my engine builders did keep a record. If not, I will have to take it back to them to be reset. Not a major deal, but hours wasted. 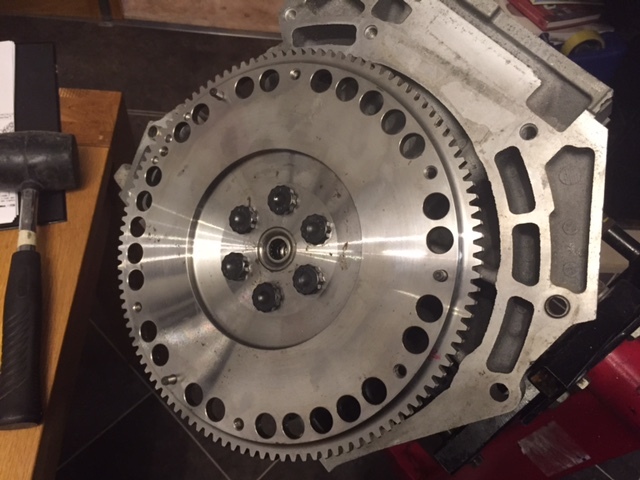 Then I went to do just a simple job – put the cam-chain guides on. The supplied bolts are socket-headed cap screws (my favourite of all the bolts) and they are to be torqued to 9.75Nm. No problem there – I have small torque wrench just for this, and it’s a 1/4 square. Arse. I have step-down from 1/2″ to 1/4, but no step up. By then it was 5pm and Halfords was of course closed. Then I went to my magnificent box of shiny bolts, and found a pair of flanged bolts that were the right size, and shiny. Did I mention how pretty they looked? So, nothing is going back into the engine if it’s scruffy. 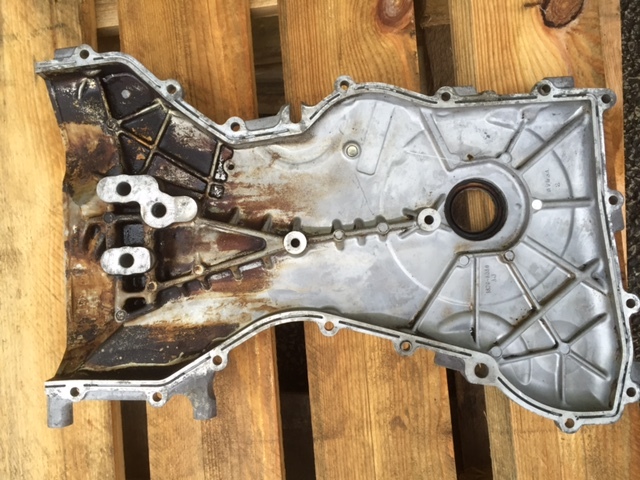 There are various ways of making it clean, but the varnished on oil from the engine front cover I very much doubt would clean up in a parts-washer. So, to the soda blaster again. Here is the before-and-almost-after picture. 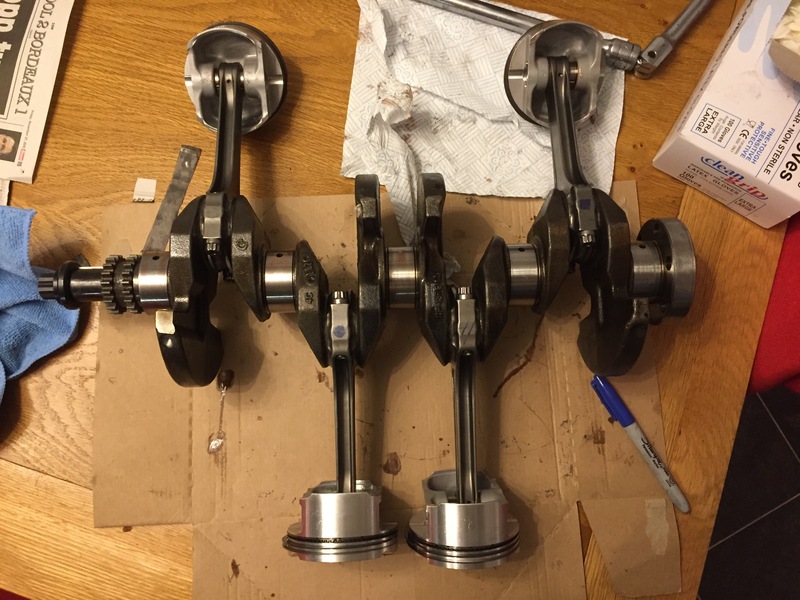 I took the crank out at the same time as I had to take the bolts out, and decided to “spin the rods” which is something I should have done before. 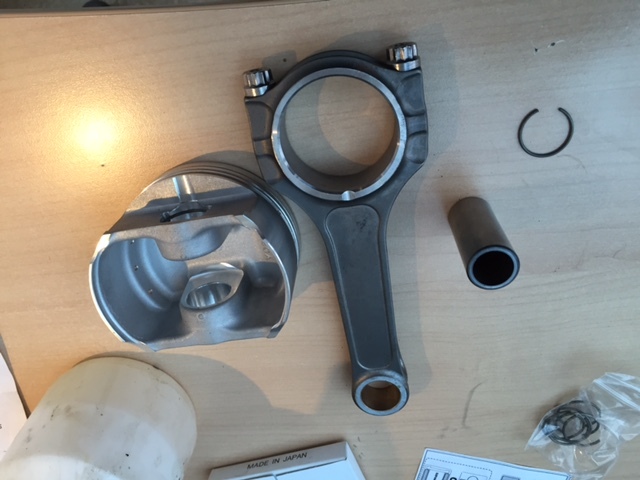 I wasn’t too concerned though, because SBD had measured my crank when they keyed it and supplied bearings to suit. However, it is good practice. One by one, the rod is attached (with lots of assembly lube) and screwed up ‘ratchet tight’ so not torqued up to any great torque. The rods should move smoothly and without any slap. Then dismantle and put a piece of newspaper in there as a buffer between the bearing and the rod and tighten again. It should jam up pretty quickly (which it did). If it doesn’t jam then you have too much clearance between the rod big-end and the crank. It’s a little bit ‘rule of thumb’ but a safe test. All mine passed, so at this point I decided to commit. 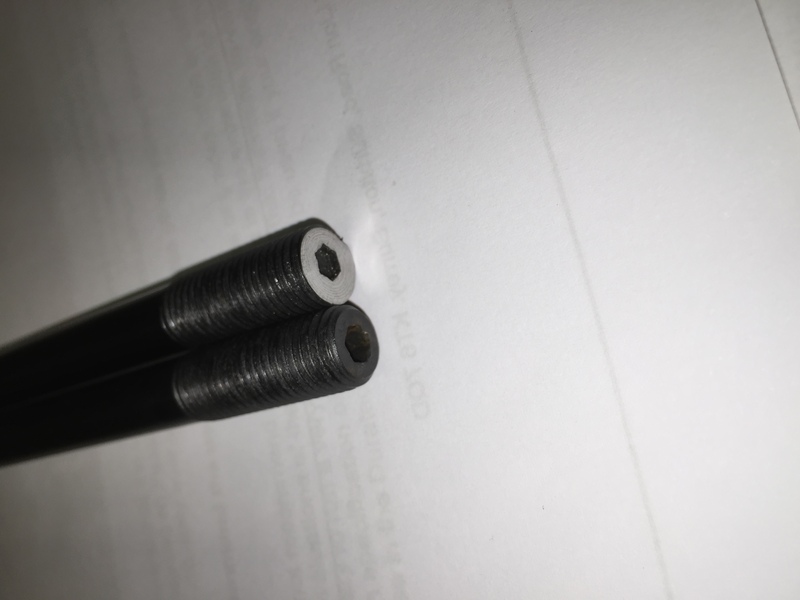 I used my sharpie to write the piston number on the top of each piston and coloured a pattern (again in sharpie) on only one side of each rod, over the joint between the top and bottom of the big end. Thus after I’ve torqued everything up and I need to take it apart then everything can go back together in just the same position as before. Taking the crank out meant I had to remove the flywheel, which had been bolted up with thread-lock. This meant I had to chase the threads clean again. I bought a set of thread-chasers to clean down the threads. However, it turns out (along with a lot of things in this duratec) that they’re 12×0.75 threads, not 12×1 which is the standard size for 12mm. Thread chasers are quite a lot like a tap, but slightly easier on the thread. It’s not a big deal, so I borrowed a 12x.75 tap and cleaned out the threads. It’s a slightly tedious job – you just keep going in and out until the crap stops falling out the end and the tap moves easily through the thread. So, tomorrow, I should be putting it all back together. So, there are a couple of things that need to change if you’re running ARP crank cradle bolts on the titan dry-sump. 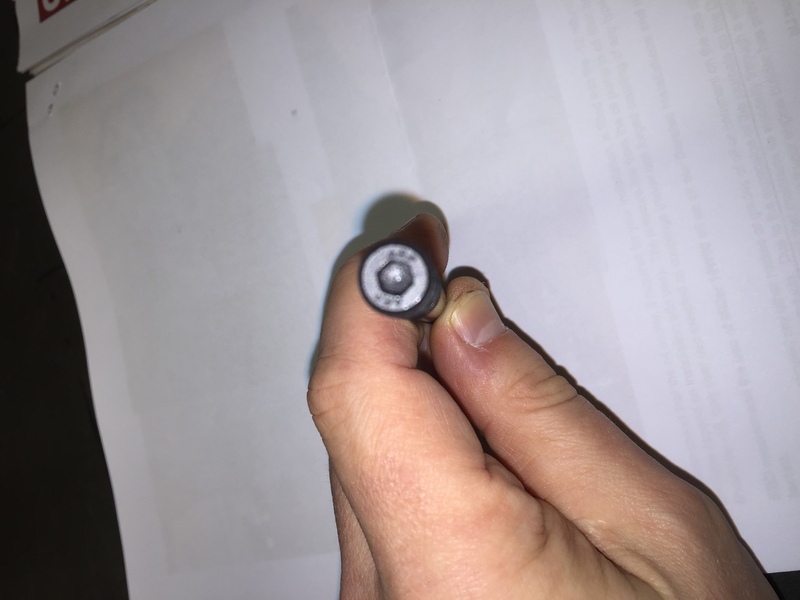 The bolts are 2mm too long. I wizzed them down to Simon and Cornering Force, and we span them in the lathe and took 2mm off them. The results are below. Then they go into the block again and the nuts spin on. They needed a little finishing off after the lathing. Firstly the sides needed a 60 degree chamfer and Simon has a lot of experience here – he puts the chamfer on so it just meets the thread, and then the nut should start straight away. You can just see a tiny lip at the remainder of the hex head in the middle (there’s about 2mm of recess left). This was filed off with a needle file to remove any overhang and a dremmel (slowest gentlest setting) to remove any protrusion. The top is now perfect. The bolts spin in to only 4Nm torque (which just so happens to be the torque on my electric screwdriver) so they’re back in the block. There isn’t enough recess left in the top of the bolt to get any more torque in than that anyway. And yes, the nuts fitted beautifully on the threads. Simon did a great job. So, ages ago I bought a universal flywheel locking tool, but it doesn’t fit my lightened flywheel at all well. So, I’ve made my own. It took less than an hour. All I did was trace the outline of the flywheel onto a bracket, and then cut and weld it to a piece of 20mm square tube. The tube was then drilled and bolted to the block. It’s a nice snug fit and should be able to take the load when the crankshaft bolt is tightened 100Nm + 90 Degrees. So, this lot arrived this week. 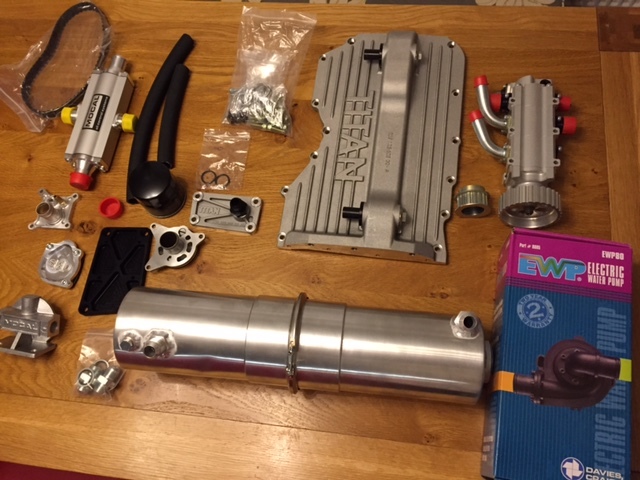 A full dry-sump kit and electric water pump. Lots of shiny. I had intended to bolt a lot of it on this weekend, but then I ended up lying around on the sofa a lot. Well, after planning everything carefully on this, I ended up rushing it in anyway – I had cleaned all the mating surfaces with acetone, put thread-lock on the bolts and using my artists paint-brush, painted ARP ultra-torque under the ARP bolt head. Bolts were turned in hand-tight. 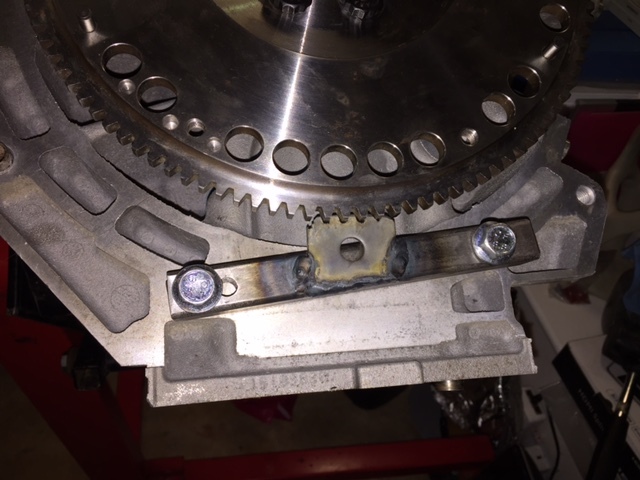 Then, I thought … I’m going to need to lock the flywheel, and got my one-size-fits-everything-but-a-duratec universal flywheel locking tool. 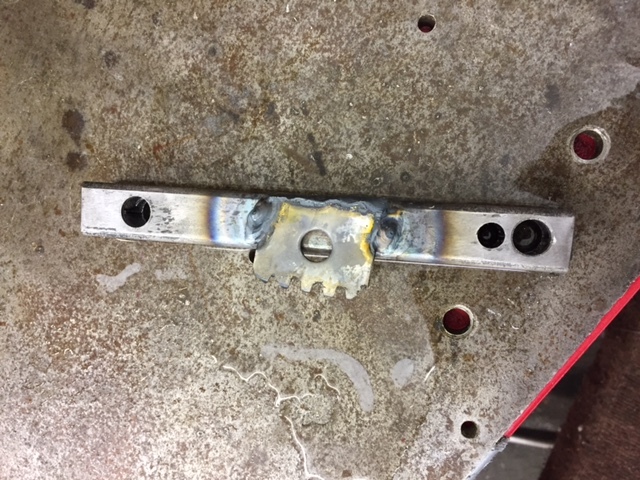 No worries – a bit of bar, a couple of bolts, a bit of plate with teeth cut out and an inch of weld, and I have a custom tool. Then I thought … meh – it’s 10pm and I need an early night, so I started to pack away. At that point a little voice in my head reminded me that there was thread-lock on the bolts, so I needed to do something pretty sharpish. I grabbed an old head-bolt, dropped it though one of the flywheel holes and wedged it against a rib on the block. 2 minutes later and I had the bolts torqued up. I torqued them to 95 lbs/ft, and did it in 3 increments of 30 lbs/ft per time. The fastening sequence was to fasten opposites. 95 lbs/ft is looking tight, on the tightness scale.